A fast and fluid interface with good performance make the Desire 610 an easy phone to use, but with its weak screen and camera and oversized bezels it doesn't offer enough to be a great mid-range smartphone. While the top-of-the range HTC One M8 has sent all rivals scattering before it, HTC has also been busy building out a good-sized range of middle and lower-end smartphones using its former flagship brand, Desire. The Desire 610 sits nicely in the middle of the line-up, borrowing much from the company's mid-range flagship, the Desire 816. The first thing that has been borrowed from its bigger brother is its design. Unfortunately on this smaller device, the design falls flat. The Desire 610 is a big and bulky phone especially for one with a 4.7-inch screen. It has oversized bezels all around that screen and a version of HTC BoomSound - stereo speakers - at the top and bottom of the phone. It is quite an unsuccessful implementation of a visual language that worked reasonably well on the larger Desire 816. The rear is made of a different material to the rest of the phone and this too has some issues. It is highly reflective and shiny and very susceptible to fingerprints and scratches. After just a few days use, it feels quite slimy and a bit unpleasant. I am constantly fighting with this phone just to keep it clean. Despite that, the phone is easy to grip as the sides are using a far nicer matt plastic, which both looks good quality and provides plenty of grip. It is nicely rounded too - so despite its bulk, the Desire 610 sits in the hand quite well (no doubt helped by being relatively light). The most frustrating part of the layout of the Desire 610 for me is the position of the power button on the very top of the phone. It's out of reach for all but the most long-fingered users unless you're holding the device in two hands. HTC has integrated the SIM card and microSD card slots nicely into the side of the Desire 610 behind an easy to open flap. It takes the smallest SIM card size, a nanoSIM, which is the same as some newer HTC devices and the iPhone 5S, 5C and 5. Being a mid-range handset, you would expect it to have relatively meagre specifications, and in truth it does. 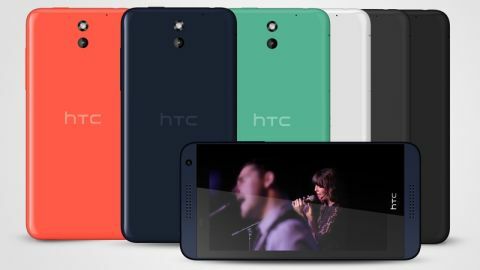 We have reached a point where even lower end handsets can perform well and the Desire 610 definitely benefits from these advances as well as HTC's clear prowess when it comes to software optimisations. Like many of its peers, a 1.2Ghz quad-core Snapdragon 400 can be found inside the Desire 610 with 1GB RAM backing it up. This makes the device plenty fast enough in general use. Helping it along is the lower resolution screen, which manages just 960 x 540 pixels otherwise known as qHD. There are other phones at the same price or less with much better screens such as the Moto G.
Whilst the lower resolution screen helps with performance, it does mean that the Desire 610 can be frustrating to read on. The screen is not quite sharp enough and feels quite outdated. It also struggles with brightness levels especially outdoors on a bright sunny day and has a somewhat cool colour temperature. All this combines to make the screen a touch fatiguing to use for long periods. The Desire 610 is only endowed with 8GB of internal storage, of which just under half is available to you for apps and media. However, there is the microSD card slot for expansion and cards up to 128GB in size are supported. I tested a 64GB Samsung card that worked flawlessly. On the back there is an 8MP camera with an LED flash. In front of the sensor is a fairly fast f/2.4 lens. The camera supports 1080p video recording, which is a welcome addition. On the front there is a 1.3MP camera for your selfies. Whilst some of the specs fall a little short, the Desire 610 does have a very wide range of connectivity options including LTE, NFC, Bluetooth 4 LE and the usual WiFi. Having all these options at this end of the market is a welcome bonus. Leaving aside the rather uninspiring design and material choices, HTC has built a nice smartphone for the lower end of the market. The real problem comes with the price. At around £225, it's coming up against the Moto G 4G, which is a fair chunk cheaper, and a whole host of other similarly priced devices that have far more successful designs or better screens. Has HTC done enough to make the Desire 610 compelling?